Buying a new vehicle isn’t cheap and in most cases it’s the second most expensive thing you’ll spend money on in your lifetime, first being your home! Therefore it makes complete sense to protect your investment from potential thieves by installing a top of the range tracking device! Here at Trackerfit we are number one suppliers and installers of car trackers Glasgow and provide you with peace of mind knowing your car is protected 24 hours a day 7 days a week! Having a tracking device fitted to your vehicle not only puts your mind at rest, but it can also help reduce your insurance premiums whilst aiding the police in the recovery of your vehicle should the unthinkable happen! As a leading supplier of car trackers in Glasgow we stock a wide range of tried and tested devices from leading brands such as CobraTrak, SmarTrack and Box! Equipped with the latest GPS, GSM and VHF technology car tracking devices are extremely accurate and are able to pinpoint a vehicle to within 10 meters of its location. If your car gets stolen it won’t be missing for long! Once you’ve confirmed the theft of your vehicle our Secure Control Centres, which are manned 24 hours a day 7 days a week, will track your vehicle until it is safely recovered. Working alongside local police forces, most vehicles are recovered within an hour of being reported stolen! With over 25 years experience all our products and engineers are Thatcham Approved. 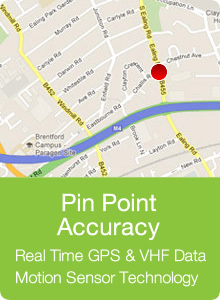 Therefore you can guarantee the car trackers we supply are of the highest quality and expertly fitted. We also offer FREE UK installation on all our products and in most cases can offer next day installation at an address of your choice, another reason to chose Trackerfit for your car trackers Glasgow! For more information on car trackers Glasgow then feel free to give us a call on 0141 343 7798.